There are a number of striking features of the American healthcare system compared with those of other developed countries: the huge percentage of our GDP that goes to health (currently at 17.9%); the enormous gap between our spending and health outcomes (i.e., the apparent lack of value); and the tremendous health disparities in this country compared with others. We have recognized these disparities as a particular problem in Milwaukee, and one of our strategic priorities is to address those disparities in our community. Our approach has been essentially two-pronged. We are addressing access to care in a variety of ways, including directly providing medical and dental services in underserved communities (e.g., Next Door Foundation), providing school nurses, and a CMMI-funded initiative to provide community health navigators and other wrap-around services. We are also working with community partners to address risk factors for poor health outcomes as varied as obesity, bullying, and unsafe sleep practices. Increasingly, though, there is evidence, as summarized in a recent Robert Wood Johnson Foundation report that health disparities are not the result only of differential health care access among the poor, but of poverty and racial bias themselves. There are several lines of inquiry. One is the role of environment (and specifically prenatal exposures) on epigenetic effects. Adverse effects believed to be related to epigenetic changes that are more prevalent among infants of poor women include obesity and psychiatric, behavioral, and learning problems. Another is the role of “toxic stress,” which is the result of repeated, unmitigated stress responses in infancy and early childhood – stresses that may result from both conditions of poverty or racial discrimination – leading to long-lasting effects on physical and mental health. The AAP has identified both of these as strategic focus areas. Even more intriguing is evidence that while poverty may be a contributing factor, the level of income inequality is more important than the absolute amount of poverty. In other words, while poverty does lead to less health care access, less health care utilization, and more exposure to risk factors, these factors combined account for only a portion of the observed disparities. Indeed, higher degrees of income inequality appear to predict worse health among not only the poor, but among the wealthy. At least part of this seems to be related to the fact that when there are big gaps between the rich and the poor, the very phenomenon of feeling poor contributes to the toxic stress. At the same time, the wealthy tend to be more resistant to public expenditures that benefit poor and rich alike. If this is even partly true, it suggests that addressing health disparities will require addressing income disparities. Talk about a Herculean effort! We’ve always recognized that we cannot solve the problem of health disparities alone, which is why we have partnered so broadly in that effort. But how can any organization, or even a coalition, hope to make a dent in the basic American economy and culture? That’s why I found this article on newborn care in Finland so intriguing. It suggests that small efforts to level the field can matter. Basically, all new mothers in Finland receive a maternity package. Unlike in the US, where kits may be given out by hospitals but vary widely, it’s the same for all Finnish moms. The kit comes in a box and includes breast feeding information, along with bodysuits, a sleeping bag, outdoor gear, diapers, bathing products for the baby, as well as bedding and a small mattress – the mattress is designed to go into the box, which serves as a crib! And the culture is such that everyone uses it. Mothers have a choice between the kit and a 140 euro cash grant; 95% choose the kit. 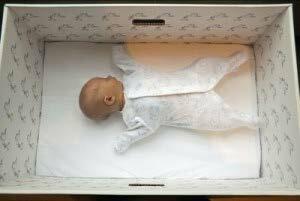 Imagine how things might be different if all babies in the Milwaukee area, whether they live in Lindsay Heights or Whitefish Bay, napped in the same type of box. Of course, that would require a cultural change that could be even harder to achieve than income redistribution. The Finns note that part of the appeal of the maternity kit is the fact that it symbolizes equality. But when it comes to children, there is a strain of American culture that supports that: for example, the traditional commitment to universal public education dating back to the first years of the Republic. When I came here in 2000, we had two physician assistants working in the emergency department (one of whom recently retired). A couple of years later, I hired the first nurse practitioner. (She’s still with us, and recently got her Doctor of Nursing Practice degree.) We now have a dozen advanced practice providers in emergency medicine, and they see roughly 20% of our patients either alone or together with a physician. Our APPs not only provide excellent patient care, but they participate in the education of students and residents. Our approach has been one of a team of professionals, with complementary if somewhat overlapping roles. This growing role of APPs is paralleled in the practice as a whole. One-third of the CSG membership now consists of advanced practice providers. In many of our specialties, they are a critical part of our workforce, a great example of our values of collaboration and innovation. Nationally, nurse practitioners, physician assistants, pharmacists, and other providers are increasingly seen as a way to address shortages of physicians, and to attempt to maximize value by providing high quality care at a lower cost. Interestingly, despite our commitment to innovation, academic centers in general, and children’s hospitals in particular, seem to have been slow to adopt this innovation. About five years ago a colleague did an informal survey of nine academic pediatric EDs. We were one of only five that used APPs at all, the only one that used them in both the main ED as well as a “fast track,” and had 50% more APP coverage than the next highest. The growth of the APP role has not been without controversy, both in our practice and in the larger community. There has been a good deal of media discussion lately about scope of practice, quality, cost, and other issues related to the appropriate workforce composition. Two recent articles shed some light on some of the tensions involved. A paper in NEJM reported on a survey of nearly 1000 primary care providers, approximately equally split between physicians and nurse practitioners. They appeared to do similar work: when asked about the services they provided, NPs and physicians generally reported a similar distribution except that physicians were much more likely to provide care of patients with chronic conditions that were not yet well controlled. Yet there were large differences of perspective between the groups. For example, while large majorities of both agreed that NPs should be able to practice to the full extent of their training and education, only 17% of physicians believed NPs should lead medical homes, vs. 82% of NPs. Physicians were far more likely to endorse the concept that physicians provide a “higher quality of examination and consultation”; 66% of physicians agreed with this statement, while 75% of NPs disagreed. And on the issue of pay, only 4% of physicians believed that NPs should be paid the same as physicians for providing the same services, compared with two-thirds of nurse practitioners. What about patients and families? A study in the June issue of Health Affairs examined preferences of 2000 adults, the vast majority of whom had had prior experience with both physicians and advanced practice providers. When asked about which type of provider they would prefer if both were available, 50% had a preference for a physician, 25% for an APP, and 25% no preference. Perhaps as a sign of evolving attitudes, younger respondents were more likely both to have had a prior experience with an APP and to prefer one. And when specific clinical scenarios were probed, in which there was a trade-off in terms of timeliness – in one case, a choice between seeing an APP the same day or a physician the next day for worsening cough, and in the other seeing an APP the next day vs. a physician in 3 days for chronic persistent headaches – 60-67% preferred to see the APP sooner. This all suggests that APPs are highly acceptable to patients, especially if it means more timely care. Taking the holistic view of quality as care that is effective, efficient, timely, safe, patient-centered, and equitable, it appears that APPs have an important role to play in assuring that quality, especially in an evolving healthcare environment. There are legal and attitudinal barriers to maximizing their potential, but I’m proud that CSG has been a leader among academic pediatric enterprises in innovating and embracing APPs as part of our team. I will admit that over the course of my career, I have not always been compulsive about cleaning my hands on the way into and out of each and every patient encounter. My “road to Damascus” moment came several years ago, when I was seeing a child with a hernia in the emergency department. The visit involved not just our team, but some consultants as well. At the end of the visit, the mother found me and said, “Congratulations. We saw six different doctors, and you were the only one to wash his hands.” All I could respond with was, “That’s truly appalling. I’m very sorry for that.” I wish I could have said I didn’t believe it, but sadly, it’s all too believable. Our own audit data show that, while there is variability across types of providers and different settings, as well as over time, as an organization we consistently fall short of our target of 90%, much less 100%. Admittedly we’re not alone. Several studies have demonstrated compliance rates as low as 10%. Still, our performance is disappointing. I have to admit, I don’t get it. First of all, I owe it to my patients not to transmit germs from one to another. It’s a critical part of patient safety. More importantly, I owe it to myself. Just the thought of the billions of microbes crawling on every surface in our facility is enough to drive me to the nearest sanitizer dispenser. Surely we all understand the importance; it’s not the days when Semmelweiss was trying to convince his colleagues that there was a link between hygiene and puerperal fever. So what are the barriers? In the past, there were some real issues. Soap and water aren’t as toxic as the carbolic acid Semmelweiss used, but they can be very hard on the skin – I can recall days in the winter when I’d come home from a shift with my hands cracked and bleeding. And sink placement wasn’t always conducive to “washing in” and “washing out.” But with the newer generation of waterless sanitizers, and dispensers galore, it’s far easier for the providers. It’s just not that hard. Increasingly, hospitals are becoming more heavy handed in their approach to improving hand hygiene. A recent New York Times article discusses the types of surveillance being used. For example, at North Shore University Hospital in New York, a video camera is activated when someone enters an ICU room. Hand cleaning is observed and monitored (from a video center in India! ), and aggregate statistics on performance posted on an electronic board on the unit. As reported in Clinical Infectious Diseases, compliance went from 6.5% to 89%! A less Big Brotherish but high tech approach is used at another hospital, where a radiofrequency tag in each provider’s ID badge communicates with a sensor on the sanitizer dispenser. If the wearer does not clean her hands, the badge vibrates to give a gentle, private reminder. I’d hate to think that’s what it takes to get health care providers to wash their hands. We all know it’s the right thing to do, and it’s been made as easy as possible to comply with. Perhaps everyone needs to be mortified by a family’s reaction the way I was to imprint it on us. In any case, please – WASH. The infection you prevent may be your own. You are currently browsing the Starting With Curious blog archives for June, 2013.